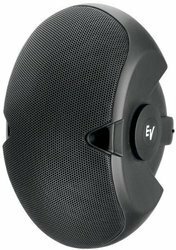 We are a leading Distributor / Channel Partner of eectrovoice evid 4.2 speakers, evid 3.2 speakers and evid 6.2 speakers from New Delhi, India. hidden leash for safety. All models are available in black or white, and can easily be painted to match the décor. Transformer versions are also available for constant voltage systems. The loudspeaker shall be a two-way system consisting of two 4” (102mm) low-frequency transducers, 1” (25mm) high-frequency transducer with a Coherent Coverage Waveguide, and frequency-dividing network installed in a vented, line array enclosure. The network shall include a passive limiter for both the low frequency and high frequency transducers. 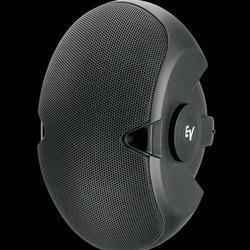 The loudspeaker system shall meet the following performance criteria: Power handling, 200 watts of EIA RS-426A continuous pink noise (6 dB crest factor); Frequency response, 65 Hz – 20 kHz (-10 dB from rated sensitivity); Pressure sensitivity, 89 dB at one watt, 200 Hz – 10 kHz at one meter; Impedance, 8 ohms nominal, 6 ohms minimum. The high frequency transducer shall drive a waveguide to evenly cover 120° horizontally by 80° vertically. The enclosure shall be molded of acrylic butyl styrene. The enclosure shall be 12.2” (310mm) high, 6.9” (175mm) wide, 8.5” (216mm) deep. The finish shall be a paintable black or white. The grille shall be zinc plated, powder coated for corrosion resistance, and restrained with a safety leash. The loudspeaker shall be adjustable over a range of 100° horizontally and 90° vertically. The support bracket shall be low profile and integral with the enclosure. The system shall be weather resistant to MIL Spec 810 and IEC 529 IP 34 test conditions. The surface mount loudspeaker shall be the Electro-Voice® EVID model 4.2.
weather resistance and a hidden leash for safety. All models are available in black or white, and can easily be painted to match the décor. Transformer versions are also available for constant voltage systems. conditions. 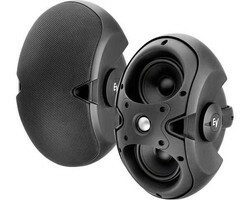 The surface mount loudspeaker shall be the Electro-Voice®EVID model 3.2. Weather Resistance "Meets Mil Spec 810 humidity, salt spray, temperature and UV, and IEC 529 IP 34 splashproof ratings"
indoor and outdoor applications requiring high-quality sound. and a hidden leash for safety. All models are available in black or white, and can easily be painted to match the décor. Transformer versions are also available for constant voltage systems. restrained with a safety leash. The loudspeaker shall be adjustable over a range of 100° horizontally and 90° vertically. The support bracket shall be low profile and integral with the enclosure. The system shall be weather resistant to MIL Spec 810 and IEC 529 IP 34 test conditions. The surface mount loudspeaker shall be the Electro-Voice® EVID model 6.2.